The PARC Bushings Vault stocks the largest inventory of new and used high-voltage transformer bushings with the fastest delivery time in the industry. Take a look at the largest available inventory of new and used high-voltage power transformer and breaker bushings in stock and ready to ship. Delivered fully tested to get you up and running in the quickest possible time. 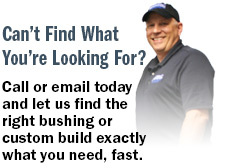 When you see a bushing you are interested in, contact us using the Inquire buttons below - or call us 24/7 at 330-493-1890. View our entire inventory below or use the search box above to search bushings by catalog number.